When it comes to the Freddy Fazbear band, the creepiest character might be Chica, the animatronic chicken taking the role of backup singer alongside Freddy and Bonnie. Chica is a bright yellow animatronic chicken with a spherically-shaped head, orange beak, magenta eyes, and black eyebrows. On the top of her head are three "tufts" of feathers. She has two talons on each of her orange feet. She wears a white bib that reads "LET'S EAT!!!" in yellow bubble letters, outlined in purple and the bib is flecked with tricolored triangles in patterns of three, and what appear to be tiny stylized pizza slices. To what does Chica owe her creep-star status? The fact that she's a chicken with a beak that also has teeth. Yes, within that chicken beak is a set of teeth, and teeth are scary. Especially on things that shouldn't have them. There's a reason we rarely show each other our teeth on the street - they're threatening. And the last thing you want out of your poultry is a creepy set of fangs. 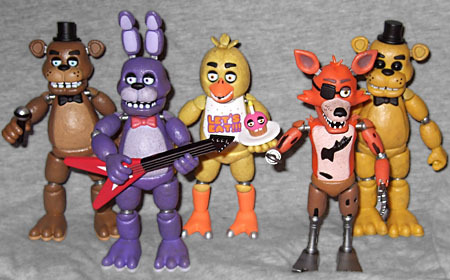 Funko have nailed Chica's appearance for their Five Nights at Freddy's toyline: she's a perfect capture of the game's 3D model and appears ever-so-slightly more detailed than her bandmates. Her "skin" is covered in bumps that don't represent feathers or anything common to birdlife, rather the soft bumpy felt of an animatronic, which compliments the rest of the sculpt. She is well painted all over, nailing the onscreen look and color scheme, complete with a very nicely detailed bib. 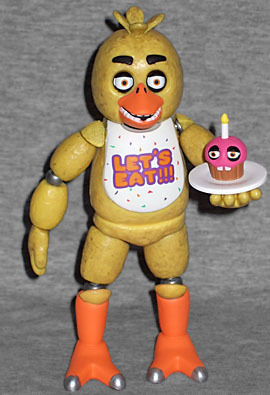 Chica has two accessories that also put her above the other FNAF figures - the first is simply another piece of the Spring Trap build-a-figure, but the other is an entirely new character! Onstage, Chica carries a tray on her left hand. 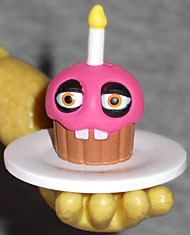 On her tray, there is a pink cupcake with two large yellow eyes, a yellow-striped birthday candle with a vinyl candle-light, buck teeth, and no wrapper. But when she leaves the stage, her cupcake will disappear. It is unknown why, or how. The enigmatic Mr. Cupcake is his own little character, with just as much mystery as the other FNAF character. (This might be a lie.) Funko have captured this guy just right - his creepy sad eyes go with his offputting buck teeth to make a dessert you'd never want to try. Chica can balance him on his tray in one of her hands (wings?) but you'll have to make sure not to give 'em a bump, lest they fall to the ground. For weeks now I've had the Five Nights at Freddy's figures on display on my desk, and I have to say I really like looking at them - Chica is by far the best in terms of sculpt and paint, but all of them look great together - it's only when I pick them up to play with them that I'm reminded how they fall short. Chica shares the same lacking articulation as her kin, with arms that fall off and no jaw movement. Although I can see why it'd be hard to make the beak move like the jaws of the other characters, it's a minor misstep that prevents Chica from being able to do this. Regardless, Chica is still a decent enough figure and perhaps the best entry in Funko's line.